Many people these days prefer to browse and shop at ecommerce stores on their phones rather than on a desktop. Having a mobile responsive web design ensures that you’ll never miss out on any of these sales. 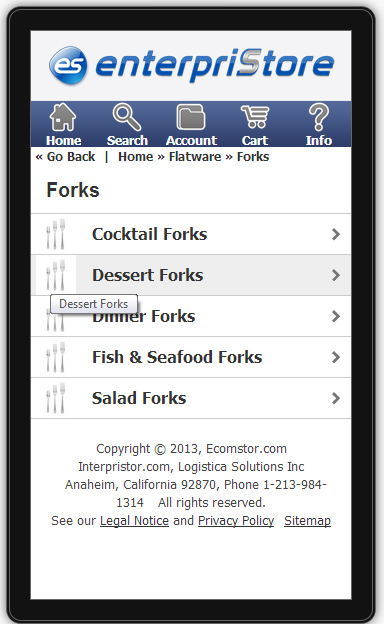 EnterpriStore facilitates mobile access to your site, with particular attention to the category and product pages. 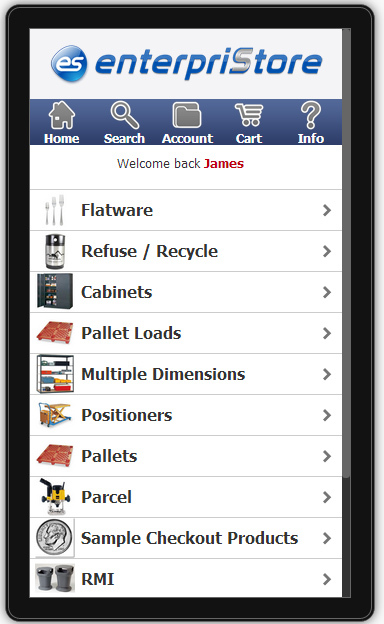 It’s just as easy to browse through categories on mobile as it is on your site’s desktop version. The categories are displayed in a simple list format with the name of each category and a small picture. In order to open up a category, customers simply need to tap it on their screen. If that category has subcategories, customers will then see a list with these. Otherwise, they’ll proceed to browsing products within that category. Products are also very easy to look through. The mobile site looks very similar to the desktop site for ideal consistency. 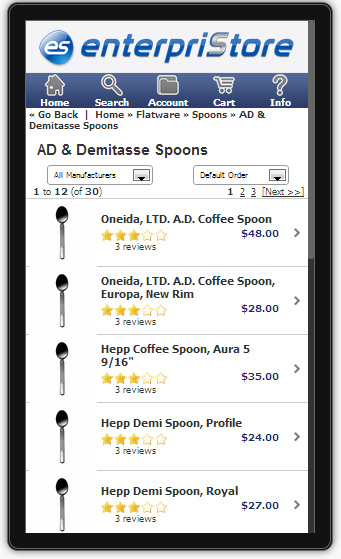 The product list displays a product image, the name, average customer rating, and price. 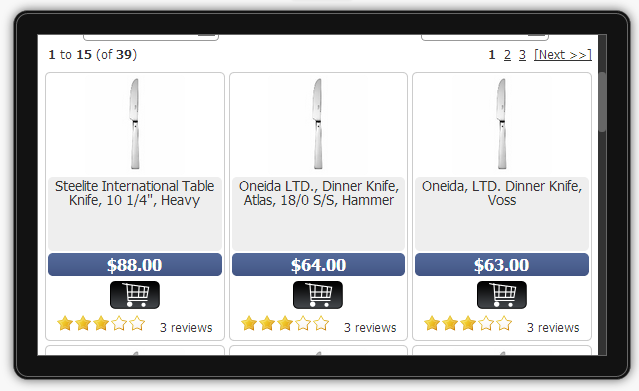 With a single tap, customers can proceed to look at the product page, from which they can add the product to their cart. Just like on your desktop site, customers can filter the product results by manufacturer and sort the results by price, popularity, or alphabetically. 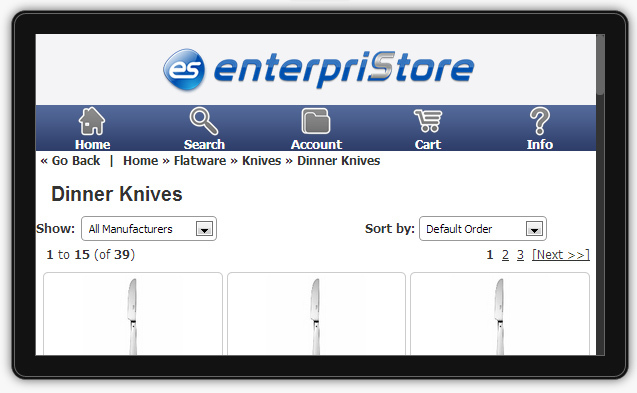 EnterpriStore’s responsive site also works well on tablets. The site will automatically adjust to the size of the screen it’s being viewed on, so it will look professional on any device. Customers will be able to use all the standard features of your site no matter the device they’re using. They can access their accounts, complete advanced searches, browse categories, view product pages, and more. As always, the easier you make shopping, the more sales you’re likely to get.